Published Sep 22, 2016 By Julia Leave a CommentThis post may contain affiliate links. 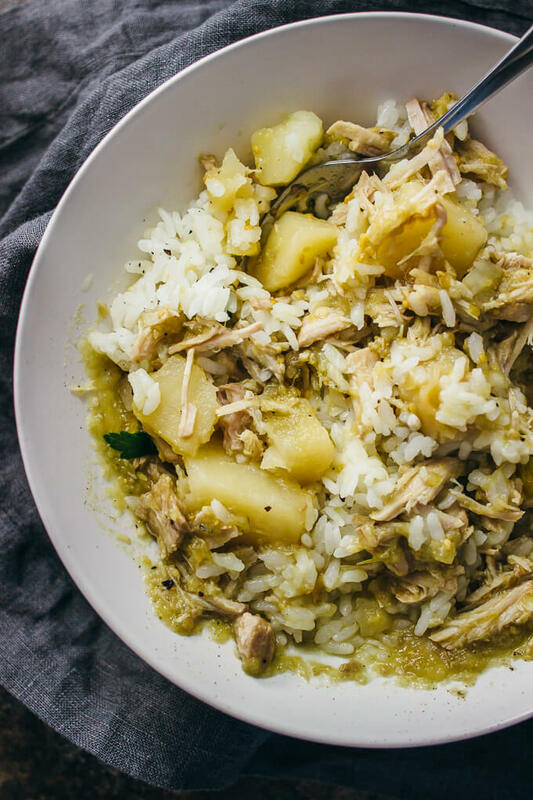 Try out this tasty chile verde stew with shredded pork and potato, simmered for hours in a slow cooker. It’s one of those easy recipes with hardly any prep work and only 5 ingredients! This is one of my go-to recipes that I can throw together with very little effort when I’m looking for an easy and fast dinner. It reminds me of this pesto pasta salad and this salmon roll sushi bowl, both of which are recipes where I just dump everything in a bowl and mix together. 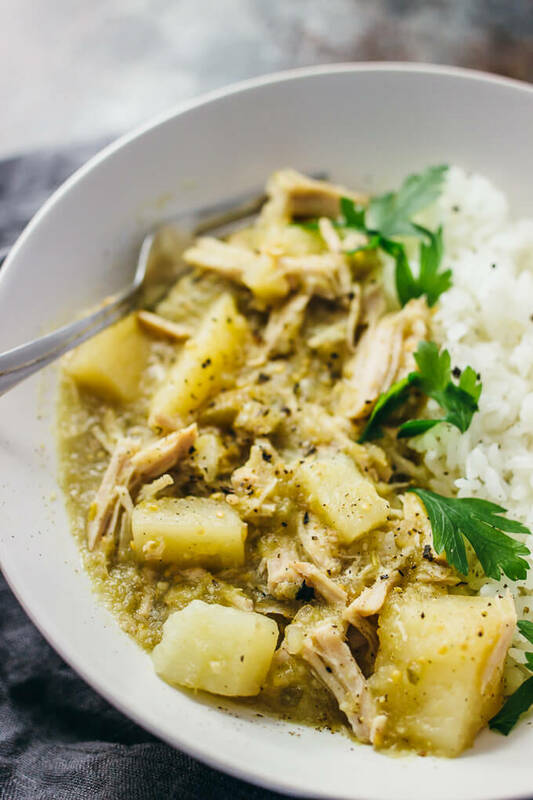 For this chile verde stew, everything gets tossed together in the crockpot: salsa verde sauce, boneless pork, potato chunks, and garlic cloves. I don’t make my own salsa verde sauce from scratch (baking green chile peppers, broiling the tomatillos, peeling and removing the skins, and so forth = too much work for an easy recipe) so I am using store-bought salsa verde for this stew. 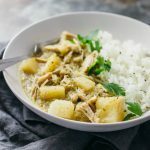 You can either cook on low for 8 hours or on high for 4 hours — I’ve tried both ways and there’s no difference — and when it’s done you can serve over cooked white rice. It’s SO good and comforting, and the flavorful sauce tastes amazing with tender shredded pork and bite-sized potato chunks. ? This recipe makes 4 servings of stew, but it’s easy to double that and make a big batch to freeze. Last time I made this, I assembled small lunch containers with portioned rice and stew and froze all of them. 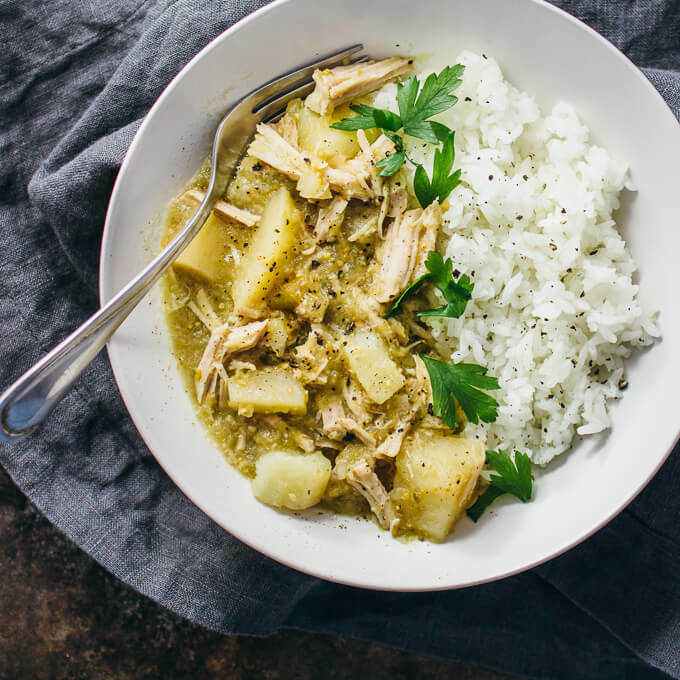 I also imagine that this chile verde stew would make for excellent burrito filling, too! Place pork on the bottom of the slow cooker. Add garlic. Add half of the salsa verde. Turn the pork over a few times to coat it in the sauce. Add the potato chunks and then the remainder of the salsa verde on top. Set the slow cooker to cook on high for 4 hours or on low for 8 hours. After it's done cooking, use two forks to break up the pork meat. It should shred easily. Mix all of the ingredients well, so that the newly shredded pork gets to soak up the sauce. While you're mixing, break up the potato chunks into smaller bite-sized pieces. When the stew is well-mixed to your liking, pour over cooked white rice to serve.